During the few years I've had the pleasure to write for and help grow the BBB, I've been a consistent critic of manager Joe Girardi. I believe that his in-game mismanagement has cost this team numerous games over the past few seasons. Up until last week, the Yankees were on top of the world. Now, the Bombers find themselves in the midst of adversity. Much of the blame for the imploding bullpen and overall decline in production falls on the shoulders of the Yankees' manager. For example, despite clear and quantifiable data that would recommend a move to the contrary, Mr. Girardi refuses to abandon bullpen roles and continues to call on Tyler Clippard in close games. The results have been the same: narrow Yankees defeats. If the Yankees end up missing the playoffs this season, the time will have FINALLY come for Girardi to pack his bags and leave New York. Before going any further, I suggest reading a piece I wrote in December titled, "Will 2017 be Joe Girardi's last hurrah?" I may have been a bit off on my assessment of the 2017 squad, but my criticisms of Girardi reign true, and have only been amplified this season. Joe Girardi has been managing the Yankees since 2008. In those nine seasons (excluding 2017), Girardi has only made the playoffs five times (really four because playing in the Wild Card Game should not constitute a playoff appearance). Granted, Girardi does have a championship under his belt. On the other hand, that was in 2009. It is now 2017. The Yankees have not won a playoff game since 2012. A lot of this has to do with the transition that the team has underwent these past few seasons, as the Bombers have successfully moved from a team loaded with overpaid washed up veterans to one infused with young talent. Girardi seems to be a guy that players like to play for; however, his in-game management is amongst the worst in the league. 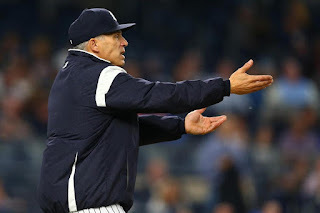 Mr. Girardi's adamant insistence on playing veterans who are not producing, and continuously bringing in relievers who cannot get the job done is unrivaled. I've been a critic of the Yankees' skipper since 2015. I will admit that the 2013 and 2014 Yankees squads had no business being over .500. Girardi has demonstrated an ability to get the best out of his players. Unfortunately, he has also shown that he can just as easily get in the way of those same players doing their jobs. At various points in the 2015 and 2016 seasons, it almost appeared as if Girardi was doing his best to lose games. Whether it be starting Stephen Drew for an entire season, or bringing mediocre relievers into close games, Girardi never ceases to make me scratch my head. This season has been no different. Despite having entered the season as the indisputable third best reliever on the team, Tyler Clippard has been abominable these past few weeks, blowing multiple leads during this most recent losing streak alone. So what does Girardi do? He keeps calling on Clippard in close games! Aside from Aroldis Chapman and Dellin Betances, it's hard to trust anyone in this Yankees bullpen. That being said, bringing Giovanny Gallegos, who just made his Major League debut this season, into a one-run game in the bottom of the ninth is inexcusable. Girardi did just that this past weekend in Oakland. Even Mr. Girardi's biggest apologists cannot rationalize some of the boneheaded moves their guy has made as of late. Now, I must segue into perhaps Girardi's biggest sin these past couple of seasons: continuing to play unproductive veterans. There is no logical explanation for Tyler Austin not being on the Major League roster playing first base every night. While Chris Carter is striking out three times per game, Austin is absolutely raking in Triple-A, hitting .287 with two home runs and 13 RBIs in 24 games. Carter has overstayed his welcome. During the time that both Austin and Greg Bird were shelved, the Yankees had no choice but to play Carter every day, but a switch is desperately needed. When asked two weeks ago about why Austin has not been called up, Girardi had the audacity to say he thought having two first basemen on the roster would hinder the Yankees versatility. Does Girardi not realize his current first baseman is as useless as they come?! The Yankees have gotten some of the worst first base production in the majors this season. Why not go to a promising 25-year old over a strike out machine? Chase Headley, another Yankee who has struggled mightily this season, continues to be the starting third baseman. Ronald Torreyes has shown he can produce if given consistent at bats, as he did during the first month of the season, filling in for the injured Didi Gregorius. With top prospect Gleyber Torres out until 2018, the Yankees should be looking at Tyler Wade to put some heat on Headley. This is an organizational decision so I won't fault the manager too much here, but his complacency is disconcerting when looking at the state of this Yankees team at the moment. I understand Girardi must do his best with the players who are given to him. Brian Cashman is part of the problem as well, and I'll lay that argument out at a later date, but this article is about Girardi. Needless to say, it's impossible to ignore the detrimental impact many of his in-game decisions have on the outcomes of games. The Yankees are slipping, and it's happening fast. If the Bombers don't right the ship this season, Girardi must finally pay the price. His contract expires at the end of the season and it should not be renewed. Just think, he's gone over six years without winning a championship, and four years since his last playoff victory. Since when does that fly for the New York Yankees?